The shark population of North Carolina has been in the news quite a bit lately. Thanks to a record-setting string of eight bites on people so far this summer (about four times what North Carolina has in an average year), there has been a surge of interest in what sharks are doing in the state’s waters. Since my research focuses on shark habitat use in North Carolina waters, I’ve been getting quite a few of those calls, mostly concerned with which dangerous species are around and how to avoid a bite. But there are a lot of interesting things about the sharks of North Carolina beyond their potential as a beach hazard. Here are three things I’ve found over the course of working with sharks in this state that I think should be more broadly known. 1. Sharks are in the sounds and rivers. Sharks make extensive use of estuaries as nursery habitat and a source of food, and North Carolina is loaded with estuaries. The Albemarle-Pamlico Sound system is the largest barrier island lagoon in the U.S. and offers a huge variety of habitat for sharks, from large seagrass beds to river mouths to treacherously shifting inlets. The smaller sounds behind the state’s other barrier islands also get a lot of shark use. Juvenile sharks and smaller species can be found within the sounds, and adults will occasionally venture inside the inlets to chase schools of fish and other prey. While most sharks stick to the saltier parts of the sound, the entire system is available to the bull shark thanks to its ability to tolerate fresh water. 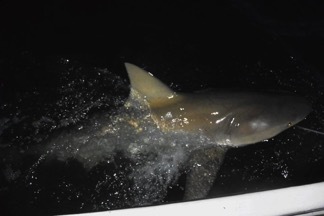 Juvenile and adult bull sharks have been caught near the mouth of the Pamlico River, and fishermen and researchers alike have encountered large adults in the rivers of North Carolina. This 8.2 foot bull shark was caught well within Beaufort Inlet in North Carolina, possibly on its way into the Newport River. Photo by Cecilia Krahforst. 2. We have sharks all year. People are generally concerned with sharks in the summer, because that’s the season we’re most likely to be in the water with them. But North Carolina is somewhat unique in that we have sharks in our waters all year long. Cape Hatteras sits at the dividing line between two major ocean currents; the Labrador Current bringing cold water from the north and the Gulf Stream bringing warm water from the south. Because of this, North Carolina represents the transition zone between the temperate marine ecosystem to the north and the subtropical ecosystem to the south, and the state sits at the northern range limit for many warm water species and southern limit for many species preferring cooler water. The end result: we have sharks year-round. Familiar summer species include the blacktip, spinner, bonnethead, and Atlantic sharpnose sharks, and overwintering species include spiny dogfish, juvenile sandbar sharks, and even great whites. There is never really a time when North Carolina waters are completely devoid of sharks, but the highest concentrations occur in the late spring/early summer and early fall, when many shark species (and other marine life including sea turtles and right whales) migrate through the area. The spiny dogfish is one of the species that overwinter in North Carolina waters, and can occur in huge numbers when the water is cool enough. Photo by Cecilia Krahforst. Though North Carolina provides optimal shark habitat, the vast majority of the sharks in our waters are smaller species or juveniles. The Atlantic sharpnose shark, which reaches a maximum length of four feet, makes up over half of the total shark catch in the inshore shark survey I run as part of our research work, and occurs with similar frequency in the shark survey run by UNC in the ocean waters off Cape Lookout. Among the sharpnose sharks, the most commonly encountered individuals are the foot-long young-of-year pups that can be ubiquitous in North Carolina waters from July through September, so much so that fishermen regard them as a nuisance. Other small species that would only bite a person in self defense include blacknose, bonnethead, and finetooth sharks. And even in a highly unusual year such as this one, the rate of bites on people is extremely low given both the number of sharks in North Carolina waters and the number of people at the beaches. In fact, if you adjust for the number of people in the water each year, the risk of a shark bite has actually gone down. Even large aggressive species such as the bull shark will almost always pass a person by without bothering them. That said, you can further reduce your risk of an already very rare event by swimming during the day, staying clear of fishing activity, and keeping away from large concentrations of shark prey such as large schools of fish. I hope those who have had the misfortune to be bitten this year have a good recovery, and hopefully this increased awareness of sharks in North Carolina waters leads to efforts to better understand how we can coexist with them. Chuck Bangley is a PhD student at East Carolina University in Greenville, NC. He blogs at Southern Fried Science, and tweets @SpinyDag. 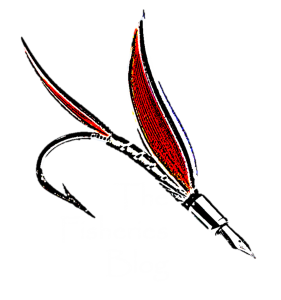 Next Post Why are fish cold blooded?